College football’s proverbial cool kids were so ready to get rid of Oregon with Marcus Mariota out of the picture. The Ducks sat at 3-3 midway through the season. 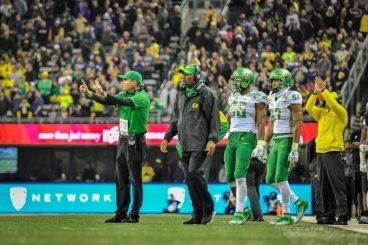 At that point, many were ready to attribute the success the Ducks have had for the better part of the decade up to an offensive system that had finally been figured out. With Chip Kelly and Mariota now both in the NFL, Oregon would finally be exposed for what they were. What the Ducks have become since then, however, is a ranked 7-3 team in a “down year” that’s won four straight games and all of a sudden has a fighting chance to play for the conference title. Most importantly, though, they’ve proven to be a program that will not go away. 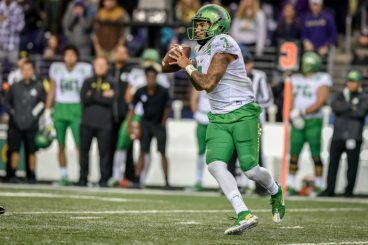 Still, even with the recent upswing in Oregon’s performance since the return of Vernon Adams from injury, the good old myths of Oregon football persist. Conventional wisdom seems to state programs such as Stanford that can control the ball for most of the game will be better off and play a more legitimate brand of football. However, this myth can be empirically dispelled. Correlation can be a useful tool when examining the relationship between two statistics. Essentially, we have a scale that ranges from -1 to 1. When a correlation is closer to 1, it is a strong positive correlation whereas correlations closer to -1 are said to be strong negative correlations. Generally, correlations that fall close to 0 are considered to be very weak, if not negligible altogether. Over the past three seasons, the correlation between points per game and time of possession for all FBS teams, while technically positive, is extremely weak at .125. Similarly, the correlation between time of possession and yards per game over that same timeframe is even weaker at .086. Clearly, time of possession is not a relevant indicator of offensive production. What becomes so frustrating about the myth of time of possession is the fact that Oregon is almost criticized for moving too fast on offense without receiving any kind of credit for how remarkable their numbers and performance are considering it. 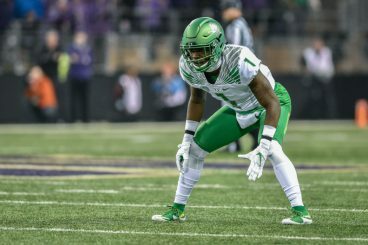 Young players such as Arrion Springs have helped improve Oregon’s defense. Every year, the Ducks finish near the top of the national standings in total plays defended. 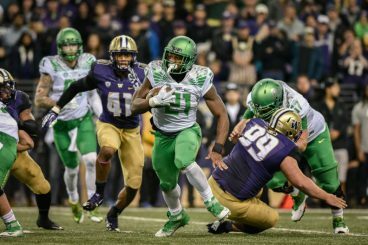 It would follow then that Oregon should be near the bottom of defensive statistics every season, especially considering the offensive potency of the Pac-12 from top to bottom and the fatigue of the players on the field. However, between 2008 and 2013, Oregon’s defense has never finished lower than 35th nationally in yards allowed per play, including Top 12 finishes in 2009, 2010 and 2013. So when one takes total yardage or time of possession out of the picture, it becomes clear that the Ducks have consistently had a very strong defense during their rise to prominence over the past several seasons. 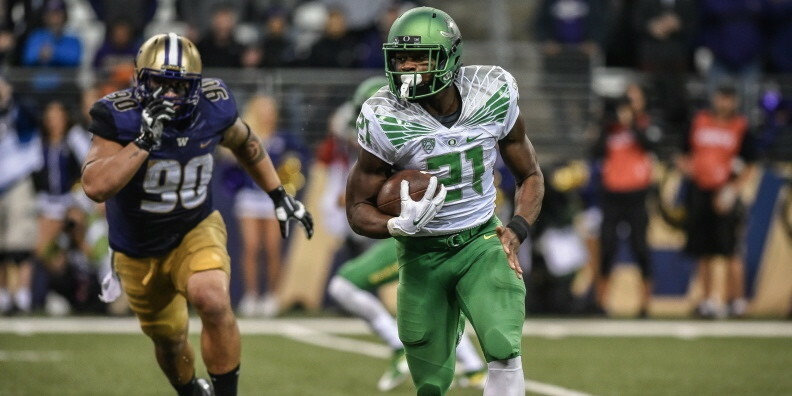 Royce Freeman has presented another good example this season. Despite Freeman’s dominance out of the Oregon backfield behind an offensive line with plenty of new faces, he has yet to be mentioned in the Heisman Trophy conversation. This is easy enough to stomach until you compare his numbers to those of Stanford running back Christian McCaffrey. I certainly don’t mean to take anything away from McCaffrey who has had a phenomenal season in all phases of the game. However, his primary job is still running back. In that realm, Freeman is superior with 38 more rushing yards and five more rushing thouchdowns than the Stanford star. Again, McCaffrey has stood out in the return game, as well, but the fact that Freeman has also hauled in 19 passes for 224 yards as a true power back is remarkable. Most importantly, Freeman also has the overwhelming advantage in terms of efficiency, averaging 6.63 yards per carry compared to McCaffrey’s 5.86 average. To some, this just doesn’t seem possible considering the disparity between Oregon’s time of possession and that of Stanford. There has to be an explanation, which unfortunately becomes Oregon’s “gimmicky” system instead of the talent of its players. Rest assured, I am not claiming that Freeman needs to win the Heisman Trophy or that any other Heisman finalist is not worthy. However it has become clear, based on both the numbers and the eye test, that Freeman is not considered to be at the same level as McCaffrey in the Heisman race solely because of his program’s reputation. Stanford plays “real” football, churning out tough yards between the tackles while Oregon’s system is making heavy contributions to Freeman’s production. But if we’re considering envirionmental factors here, why not account for McCaffrey’s offensive line? Of the five starters on Stanford’s front wall, each player was either an elite recruit or a returning starter. We see no asterisk next to McCaffrey’s stat line because of the help he gets from his offensive line, yet Oregon players are consistently dinged for their up-tempo offense. The fact is Oregon is two plays away from being 9-1 and in full control of their own destiny for the Pac-12 Championship game. Aside from one series after a Stanford sack and strip, the Ducks controlled the game against the No. 7 team in the country on the road last week. Who knows, they may even be two plays and one Vernon Adams finger injury away from being 10-0. In other words, they are not going away. With that in mind it seems important to point a couple of things out. First, time of possession is irrelevant in terms of team and player success. Second, a low time of possession doesn’t take away from a team’s legitimacy. Any doubt regarding these claims can be disproven by the correlation statistics above and the scoreboard that read 38-36 in Palo Alto last Saturday night.